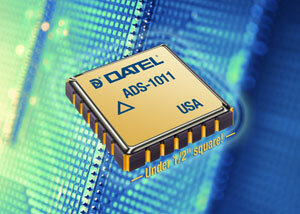 DATEL, Inc. has announced the introduction of the ADS-1011 series, a new line of Analog-to-Digital converters that are 10-bit resolution and housed in a 24-pin LCC hermetically sealed ceramic package. Each unit features guaranteed no missing codes and is 100 percent tested for performance across one of three standard temperature ranges: 0 to +70C; -40 to +100C; -55 to +125C. The ADS-1011 can run from as low as +2.7 Volts up to +5.5 Volts supply. The ADS-1011 offers a unique architecture that includes a sample-hold, successive approximation ADC, and high speed microprocessor-compatible serial data transfer, while consuming less than 10mW of power at 250 kHz throughput. The ADS-1011 is rated to withstand a minimum of 30k Rad. It features 60 dB of SNR and -65 dB of total harmonic distortion. With excellent Differential and Integral Non-linearity specifications, the ADS-1011 should be considered where precision and reliability are required. The ADS-1011 series is manufactured in DATEL's USA facility, which is certified to MIL-PRF-38534 standards. The device is available in commercial as well as military/high-reliability versions. RoHS and non-RoHS versions are available.